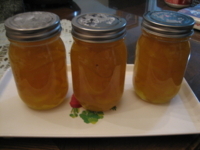 My mother sent to me a homemade Yuzu (Japanese Citrus) jam from Japan. So I would like to introduce the recipe of this fresh and savor jam. You can enjoy this jam with tea, yogurt or pancake! 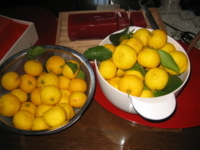 1) Cut Yuzu in half, remove seeds and stem end. Slice rind thin or grind fine. 3) Add granulated sugar and simmer 30 minutes until it jells. 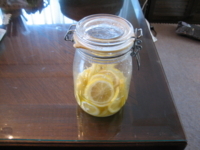 4) Pour into sterilized glasses and seal.